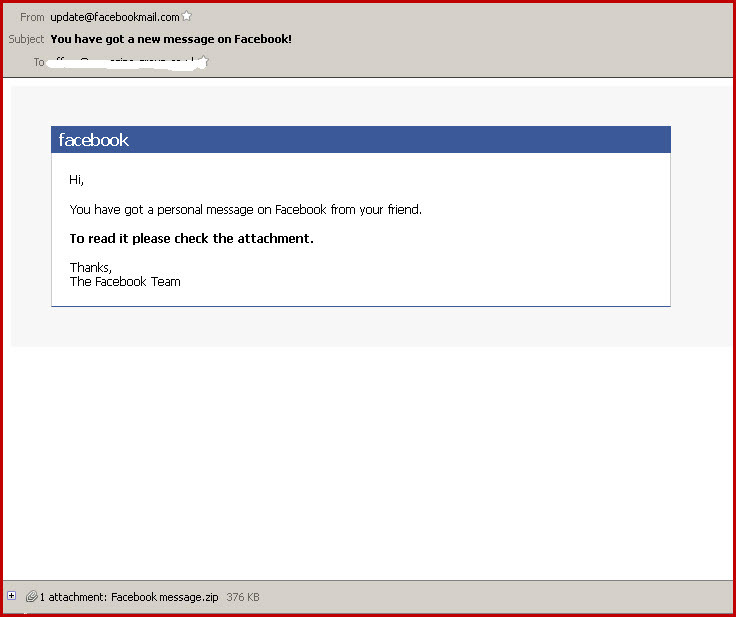 Home › Email Scams & Phishing › Beware of the Facebook Trojan doing the rounds! Beware of the Facebook Trojan doing the rounds! The marjority of internet users spend time on social networks, such as Facebook. Through the convenience of social networking sites, spammers can easily gain access to your personal information through wall posts like: images, videos, links and attachment or through email pretending to have been sent from facebook mail services. Omniquad has identified and intercepted significant activity related to spam e-mail messages that purporting to come from facebookmail.com. The body of the e-mail message instructs the victim to click the image/video or open the attachment to see the message. However, attached .ZIP file contains an executable file within it, when the user click on it the file will be executed and it attempts to infect the system with malicious code. This trojan may modify the system registry and file system, also this trojan could also attempt to download and install further malware on the infected system and in turn, it may infect other computer within the network. Instead of the attachment, Facebook spammers may disguise URL to harmful websites, which may mislead one to think you’re just clicking over a legitimate article or blog, but In reality, these links lead to sites that can install malware, spyware, and other viruses on your computer. Beware of spam links. Please don’t just click links shared from Facebook, it could be spam. Some times, friends/contacts accounts may be infected and trying to target the list of his/her contacts. If you think it strange that one of your contacts shared links on their page with videos about young girls being caught on webcam, or people caught doing explicit things, cute kittens or even penguins dancing Tango, asking you to click and like, be careful, it could be a malicious spam link, aiming to infect your computer and your network. Facebook Trojans can infect your pc and your system from both links in emails, and on your wall. If you have any experience of Facebook spam or scams, drop us a line, we are looking for more examples. For more information about staying safe online, look at our Info Central. Mexico – Malware is spread among Facebook users « It dont Matter!